To view a very early (pre-pre-alpha) demo of the Living Molecules app, check out this YouTube clip. In a nutshell, this app can be used to photograph molecular glyphs, which work like QR codes, except they unlock explicit chemical content. It can view and import the associated chemical data, export it to other apps, and also be used to create molecular glyphs. These glyphs can be included on posters, documents, websites, etc. The outer hexagon is the recognition reference frame, which allows the app to line everything up properly. The dot pattern inside the hexagon is the payload: it provides just enough bits of information to provide a checksum and an identification reference to a source of data that can be located on the internet (e.g. a MolSync molecule or datasheet code; a ChemSpider molecule identifier; or any number of other ways to reference chemical data). 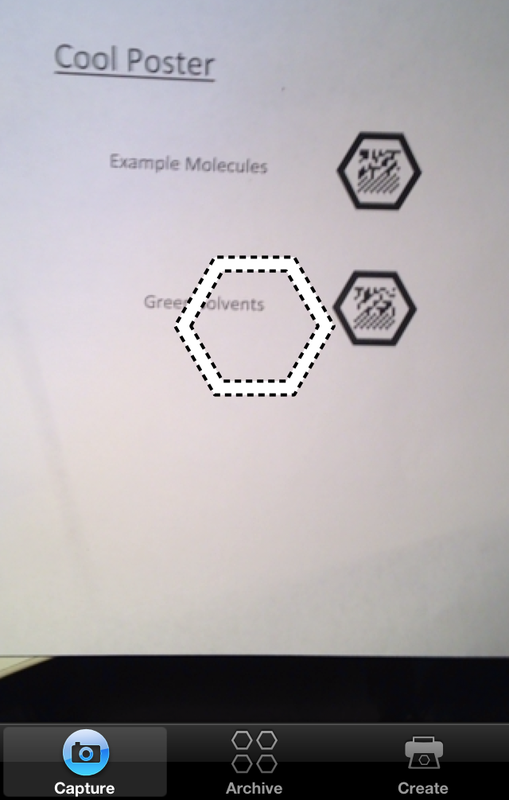 As is better shown in the YouTube clip, the method of operation is to orient the camera so that the white hexagon in the centre overlays on one of the hexagons for the molecule recognition glyphs on the substrate (which can be a piece of paper or a computer screen). Once the software is able to find a successful match, it then looks up the corresponding data, and displays it over top of the live camera feed. If you can imagine pointing your iThing at a poster, the appearance of molecular structures and data is a form of augmented reality (albeit a relatively shallow implementation). At the present time, the math for recognising the glyphs is a little gnarly. The algorithm does a reasonable job of coping with minor variations in distance or rotation about the Z-axis (i.e. clockwise or anticlockwise as you look at the paper), but right now it is necessary to hold the device quite accurately perpendicular to the source, because on a Sunday afternoon my algebra is not up to that final challenge. In the clip, you can see that I nailed it with the first glyph (Example Molecules), but with the second one I took a few moments to get it right (Green Solvents). The intended use case is mainly expected to be posters: the problem that will be solved is that sometimes it would be great to include a lot more information on a poster, such as structures, reactions, activities, properties, etc., but there just isn’t enough room once all the titles, text, graphs, results, etc., are squeezed into the size constraints. When this app is released, you will be able to create a datasheet with that structure-centric auxiliary data, and include a molecular glyph somewhere on the poster. Then anyone can walk past, whip out their phone/tablet, and snap the glyph: the content will be promptly downloaded from the internet, and made available to the onlooker. And the app is intended to be free, at least for the basic version. No definitive timetable for when it will be completed, but probably weeks rather than months.